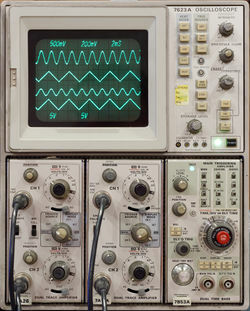 The Tektronix 7623 is a 100 MHz analog multi-mode storage mainframe, introduced in 1972. The 7623A facelift in 1975 increased standard writing speed to 150 div/µs (from 100 div/µs for a 7623 without option 12). Front panel controls were changed in the 7623A, too. The 7623B version, specified at 100 MHz, added a reduced scan mode to increase stored writing speed (essentially it was a re-named 7633). It replaced the 7613, 7623A and 7633 in 1991. There were also R7623(A,B) rack-mount versions. The 7623 uses a Transfer storage CRT which includes an internal, fast-responding storage mesh. In fast mode, the time base is inhibited after a sweep, and the transfer cycle is started. Individual sweeps therefore occur in about one-second intervals. The vertical output amplifier is built around a 155-0080-00 hybrid in the non-A version. The 7623A vertical amplifier is a discrete design with bridged T-coils. Other custom Tek ICs used in the 7623 include 155-0011-00 clock & chop blanking, 155-0022-00 channel switch, and the 7000 series readout system chips. The 7623, like the other 76xx models, has a linear supply which does not provide +5 V for lights (A9) without modification. This page was last edited on 22 March 2019, at 04:48.